Infamous' ending indicated that a sequel was already planned, but a recent domain registration emphasizes it. 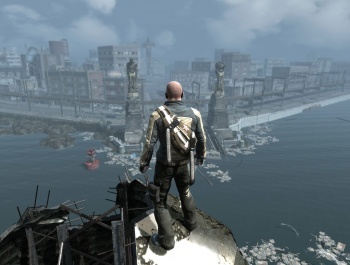 Infamous was a shining light in the PlayStation 3's exclusive library in the summer of 2009. an open-world game that told the story of Cole MacGrath and his newly acquired electricity-based superpowers. As discovered by superannuation, Sony Computer Entertainment America has registered a domain name that points directly to a sequel. From these words, one can conclude that SCEA registered a domain for an Infamous 2 website on April 27. Could this mean that Infamous 2 is in development? The 8-ball says: Probably! This was basically already known, but the domain registration could also indicate that the game will be announced soon. The only way this would be surprising is if you didn't play the first game all the way through to the end. The ending of Infamous was like the endings to the Back to the Future movies, which basically had the trailer for the sequel before the credits. Or, you could say it was like Dragon Ball Z, where the world's mightiest warriors would defeat a really tough foe that would tell them an even tougher foe was on his way to them in a spaceship. Infamous is a pretty awesome game and in my opinion a must-play for PS3 owners. Not only can every single building in the game's large open-world be scaled, but Cole's powers and appearance change depending on whether he/you choose to roast enemies and civilians alike or to be more careful and heal innocent bystanders. The story was decent as well and has a Fight Club-ish twist at the end. It'll be interesting to see if Infamous 2 ends in a similar way to the first game, or if developer Sucker Punch ties Cole's story up with a bow.